New Year's Eve Events in Tampa Bay! New Year&apos;s Eve Events in Tampa Bay! Hey folks! Jerm here with an update for you on some of the awesome events going on here New Year&apos;s eve as we celebrate going into 2012! Now since this area that we live in is so freaking awesome, as you can imagine there will be plenty of events going on all around the city as well celebrate the dropping of the ball and entering into 2012. With that having been said, I just wanted to drop by with a list of some of the most awesome ones as told by our friends over at 813 Area. Now this post will serve as an ongoing post in that we will constantly be updating it as we find more events. So here are just a few, but be sure to tell us of more or if we left off one! 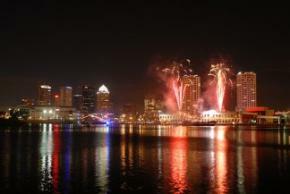 Tampa Bay NYE 2012 Dec 31, 2011 9:00 PM - Thank you for your interest in attending the 2011 New Years Eve Gala at the Tampa Convention Center. Brought to you in association with: the City of Tampa and The Tampa River Walk. NEW YEARS EVE TOAST 2012 at Channelside Cinemas Dec 31, 2011 9:00 PM - The NEW YEARS EVE TOAST 2012 at Channelside Cinemas offers a $1000 balloon drop, giant screens to watch the ball drop in New York City, spectacular fireworks display, great drink specials, and much more. As you can see, there is a lot going on here, so start planning now! Also be sure to check back as we will be doing giveaways for entry into some of these Tampa Bay area events!